Loud, explosive chink. Song is simple warble that rises and falls in pitch. Description: Broad chestnut wing bars (paler in female). 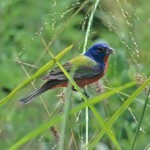 Large heavy bill; larger in size than similar Indigo Bunting. Male is deep blue overall with black around bill. 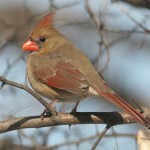 Female is light brown overall with blue shoulder patch, grayish-blue rump, and dark tail. Juvenile resembles female. First spring males are mottled with blue and brown. Behavior: Has habit of twitching and spreading its tail. Habitat: Open streamside woodlands, weedy pastures, old fields with scattered saplings, and hedgerows. Where in Nebraska: Uncommon and highly local in eastern Nebraska, and rare in the Pine Ridge. 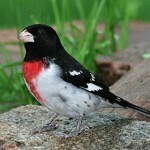 Nebraska Seasons: Uncommon spring and fall migrant and local summer resident almost across the state. Uncommon breeder statewide. 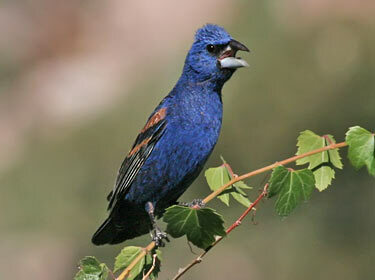 Fun Facts: The Blue Grosbeak sometimes uses snakeskin as nesting material, which is thought to scare away predators.